By Łukasz Białek - MD. Why should we calculate RTS? Revised Trauma Score (RTS) is a scoring system which considers the physiological response to trauma. It is used by intensive care specialists and emergency physicians to determine the health status of the patient and the survival probability. Using only three simple clinical data which are assessed in every patient in an emergency makes it feasible in every situation. What pathophysiological changes happen in trauma? Why do you need to use RTS? What does the result tell you? Major trauma is an injury that may lead to death or disability. According to WHO it is one of the leading causes of death worldwide. Regardless the cause and type of the injury, pathophysiological changes lead to decreased organ perfusion, cellular ischemia, and a cascade of edema and inflammation what causes fever, altered mental status and increased heart rate, cardiac output and metabolism. The more severe the trauma, the more intensified pathophysiological changes and the poorer prognosis of the patient. The scientists develop trauma score systems to describe the severity of injuries or the prognosis of a patient (which correlates with seriousness) with a single numerical value. The purpose of trauma scales is to improve and simplify communication about trauma cases and to support decision making in the individual patient. Values of RTS may range from 0 to 7.8408. The lower the value of RTS, the poorer the prognosis is for the patient. Patients with RTS value of 4 and less should be treated in trauma centers. The survival probability correlates with RTS value. He should probably be treated in the trauma center. 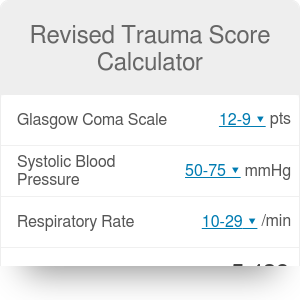 Revised Trauma Score Calculator can be embedded on your website to enrich the content you wrote and make it easier for your visitors to understand your message.